MyZone heart rate monitors are available for sale at the Milestone service desk or in the personal training office. MyZone monitor screens have been installed in the facility (Room B, Cycling Room and lower level Rogue equipment area) so you can track your exercise effort! If you have questions about MyZone or how to use it, please contact Lisa or Maria (personal training co-directors) at 896-3900 x 115. “What is MYZONE?” is probably a question many of you have asked in the past few weeks. Let’s get the techy, fancy-schmancy part out of the way before we get down to why this is a tool that can greatly improve your overall fitness and the way you think about your workouts. MYZONE is a Heart Rate monitor that is attached to a belt and strapped around the torso just below your chest. When you register your belt and give your base statistics (age, weight, gender), a resting and max heart rate are predicted that are used to monitor workouts, give feedback by way of color-coded zones and award standardized effort points - aka MEPs. Now that you have the basic rundown of MYZONE and heart rate training, your rightfully skeptical self is probably asking “Why would I get this? I already have a Fitbit, Apple Watch, Jawbone…” Yes, we are swamped with wearables these days. 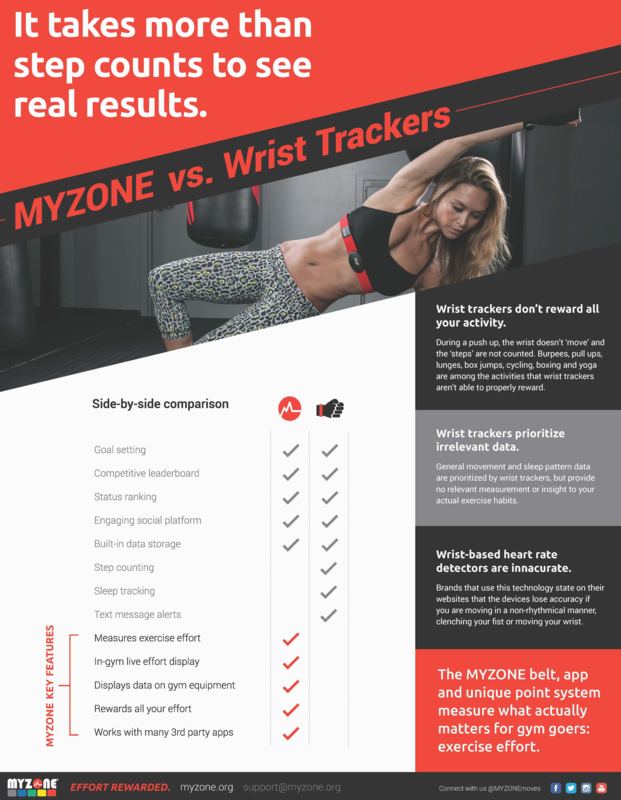 Let me give you a few reasons to consider trying MYZONE. Download the app/go on the MYZONE site, make an account, enter your belt’s number and boom, your phone and the MYZONE do the rest. Second, it wasn’t uncomfortable. I had expected it be really annoying to have on my body while moving around, but after the initial odd feeling of having something strapped around my chest, I actually forgot it was there. It gave me the most efficient workout possible. Third, I could monitor my progress from start to finish and control how hard I pushed myself based on where I was. When taking one class, I got into the red, I could control my breathing and get myself back down to the yellow then push myself back up to the red; a true interval training experience. With this controlled fluctuation, I was able to give myself the strongest “afterburn” (when your metabolism is at a heightened state and remains so post workout - one of the biggest benefits of interval training) I’ve ever had. I was sweating through the next few hours of my shift. It was incredible. In your personal training sessions, MYZONE is an incredible way for you and your trainer to keep tabs on where your body is to really make the most of your time, energy and thus have a bigger “bang for your buck”. Bottom line MYZONE is really proving to be a far more accurate and helpful wearable. Plain and simple. Still need more why? Let’s cover some additional common points of contention. Yes, step counters do help keep us moving. I still wear mine and plan to keep doing so for daily goals. However, as fun as they are, they are not completely accurate. I’ve gotten 500 steps on my couch angrily playing Mario because I kept falling in the holes, but 0 in a 45-minute spin workout. Additionally, wrist heart rate monitors are fickle. In that same spin workout, I was also wearing my MYZONE, which showed me pushing myself up to a 93% (175 beats), while my Fitbit displayed 72. I may be training my heart, but not THAT well. Yes, step counters keep you motivated and you can challenge your friends, set step goals, etc., but MYZONE offers that too. Shared experience has time and time again proven to be an effective way to stick to something. It works. It absolutely works. After using MYZONE for two weeks and really focusing on moving myself up to the red/yellow, back down to the yellow/green and back up again I’ve already knocked down 5 lbs - a number I’ve been re-checking for the last few days to see if wasn’t just a one-day influx. It broke my plateau. I may be a trainer now, but I wasn’t a year and a half ago and I certainly didn’t look like one then. It’s a journey I’ve been on that I’ll save for another blog, but I’ve been focusing and specializing in HIIT since I became certified so I’m no stranger to it. Simply put, I know how to push my limits past my threshold to an anaerobic state (the red zone), but staying in that zone does not continue to burn off fat, you need to bring yourself back down to aerobic (yellow/green) to replenish so you can go back up and burn that off, wash/rinse/repeat. It is also not good to stay in an anaerobic state to too long as we simply do not have the energy reserves to sustain that output for too long, unless you are an endurance beast. Endurance beast I am not, but HIIT guy I have definitely become. However, I haven’t been able to knock down any more weight for the last five months, even after re-evaluating my eating habits. I needed something to tip me over the edge. MYZONE is allowing me to keep specific tabs on moving myself through the zones during my workouts that no amount of trainer experience and study was going to give me. For cardio based workouts: an undeniable yes. Not only does it let you physically see the numbers for where you are, but you can tune better into how those zones feel to your body. For weightlifters: maybe not as much, but still a yes. If you are someone who is just looking to bulk up this may not appeal to you. However, I do wear it during my lift days because I want to be careful of how hard I’m pushing myself and keeping myself in a calmer, yet active state. Using the belt, I can lift and keep myself in the green or maybe even go into the yellow a bit so I can make sure I’m keeping a good blood and oxygen flow to my muscles, which can result in a more effect workout. Plus, just as I tell my clients who just want to do cardio to lose weight that they need to lift some and build a muscle foundation; I will tell lifters the value of effective and proper cardio training. So my actual answer regarding lifting is yes.